The House of Commons Justice Committee recently announced it is launching a study on this issue. This is an important first step in developing a national strategy. Please help continue the momentum by telling the Justice Minister that this issue matters to you. Social media and websites are being used every day to promote dark ideologies, incite hostility, and glorify violence against Jews and other minorities. This toxic content can have a dangerous effect on disaffected, vulnerable people. Not enough is being done to counter these dangerous trends. The Government of Canada should launch a national strategy to combat online hate. Working with social media providers, this should include a concrete plan to define, track, prevent, and intervene to stop online hate. When thousands of Canadians speak as one, it sends a strong message to our elected leaders. Join us in calling on the Justice Minister to make this a priority. 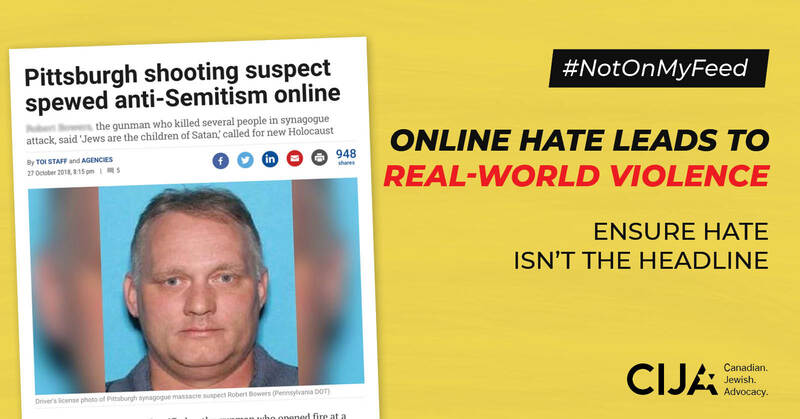 Spread the word on social media and let your friends know you that online hate leads to real-world violence.